We usually go through cycles of having Sun Chips in the house; two bags in the house for while and then none for months. Like some relationships in life, sometimes you just need a break and then you find a re-kindled appreciation for it. Chips, people, it’s all the same. Ethan likes to say Sun Chips are “healthy” because the commercial says their factory runs on solar energy. Wow, it’s like eating a piece of the sun! Snyder’s is from PA but I had a hard time finding these in Boston (although we have plenty of their pretzels) and found them on the west coast. So I’m not sure of their availability. Ethan thought these had a nice density to them and described them as having an “honest crunch”. He also thought these had a nice tang. There is something “earthy” about these, which is good when you’re in the mood. I like the crunch of these but the taste is just okay. I thought it was kind of interesting that these had more fiber, but also more sugar and fat. You can’t tell from the picture but these were a little smaller than Sun Chips. Ethan thought they smelled weird and that the crunch was disappointing. These lacked “substance” and were very airy like Muncho’s. Ethan thought they had a bland, vague flavor. I liked the subtleness of the flavor and the delicate texture. Different but the same. These both fit the bill of crunchy, grainy chips with flavor powder on them. Ethan continues to prefer Sun Chips but I liked Snyder’s for the lighter texture and smaller size. Although we preferred opposite chips, I don’t think we’d refuse the other if that’s all that was around because they’re still very similar. 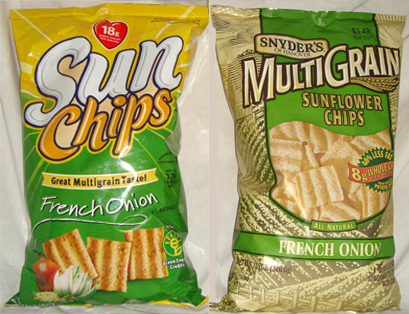 Sun Chips or Snyder's Sunflower Chips? The Snyder’s chips do not have the Grain like texture of Sun Chips. Based on this the Snyder’s brand has less crunch I will not be purchasing them again. When will Snyders come out with some new Sun Chips? Snyder’s is the tastiest! Just the right flavor and better all around! Wow! I thought we had a good sun ship but after trying Snyder’s there is no doubt that they have the best product on the market! This is definately a step back for us at Frito but rest assured we will raise our prices and reduce weight to regain market share! I FLIP FOR SNYDER’S CHIPS! Snyder’s kills the competition in taste! Snyder’s Sun Chips are better because they’re not so heavy to eat. The crunch is just right and the flavor fills you mouth! I keep a bag of Frito Sun Chips in the trunk for world crises or emergencies. Last year I got stuck in the snow. I threw a bag of them under the wheels and away I go! On election day; vote for a winner…vote Snyder’s! Are you kidding me?! Not even a comparison…. Snyder’s Sun chips are far superior in taste and price!!! Wow! Snyder’s of Hanover Sunflower Chips are great! Sunchips don’t even compare! Go with the SOH Grain! The Snyder’s are much better than the other brand ! Why can’t I get Snyder’s in our vending machines? Being a mom of many – Mom’s prefer Snyder’s……. variety, constant qualityand fair pricing against the competetion. If you like the sunchips you need to try the other Eat Smart products – you’ll be going back for more. My kids love them…. My friends….we all know who has the better chips….my friends….the best chip is….my friends….with the best crunch and taste….my friends….it’s Snyder’s…..my friends! For anyone really curious, I believe the Trader Joe’s grocery chain sells Snyder’s chips. Not even close…Snyders by far is a better chip, better flavor, better price, better everything…Believe me, i used to work for FL and you DO NOT want to know how they make those SunChips…not healthy at all!!!! Snyders, is a great American Company ! When are we getting Chicken Wing flavored Snyder’s chips? What a match…healthy chips and healthy chicken wings! Love em HOT!! I once found a hair in my bag of Frito Lay Sun Chips……ATTACHED TO A HUMAN HEAD. I really do like Snyder’s product better though. Bought this product by mistake, thought I was buying Sun Chips. Now I’m hooked. Snyder’s Sunflower chips have better flavor and just the right crunch. The Snyder’s multigrain sun chips are really great! If you like multigrain snacks you should try Snyder’s multigrain tortilla chips and their multigrain pretzels. They are awesome! I am totally hooked. Snyder’s!!! Better for you and lighter too!! Snyder’s Rules Frito Drools!! All Snyder’s products rock This is up and coming company Frito gotten to big their prices are high and their products are losing their luster. 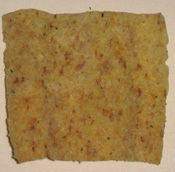 The Snyder’s chip has a harder bite than Sun Chips but the seasonings are much more flavorful. Snyders chips are so much lighter than Sun Chips and they have a wonderful flavor. They are my favorite. How the hell did Sun Chips lose to the no name brand? 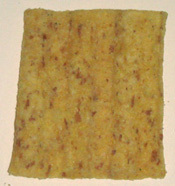 I realize Snyders is a big company, but as far as multi-grain chips are concerned, I thought Sun Chips had the monopoly. Can’t stop putting my LIPS around them Snyder’s Chips! I never like stuff that was good fo me but they had a FREE Sample at the store udder day and girl…………. they was toooooooooooooo goooooooooood! You go Snyder’s. For some reason I don’t care for this type of chip at all, although I never tried Snyders. I’m not sure if that would make a difference. For me Snyder’s have always been a bit lackluster in taste, crunch and flavor. The only thing of theirs that I enjoy are the Honey Mustard and Onion Pretzel Niblets. I was fooled by those Snyders @ the store … since they were on sale I tried them. They are NOTHING like SunChips … I was highly disappointed. WOW… looks like Snyder’s employees are in the house… Frito Lay Sunchips hands down, no competition! Did they have a flavor labeled as ” original ” when you found Snyder’s? Because from what I know, there are Cheddar, Original, French Onion( The kind you used 🙂 ) Garden Salsa, and some flavor I can’t think of but comes in a gray bag,I think. I love Sun Chips and thought these would be a less expensive alternative. I was way wrong. I do not like the Sunflower Chips. Texture and taste like cereal box carboard and dirt, with salt and flavor coating. Spot on with this write-up, I really assume this website needs rather more consideration. I’ll probably be again to read much more, thanks for that info.